Sometimes, it's the simple things that make life most enjoyable. Sometimes, all I want for dinner is a simple tossed salad. Red leaf lettuce, arugula, frisee, radish, tomato (up there at the back, you can just barely see one peeking out), sunflower seeds and dried cranberries tossed in a home-made mustard and apple cider vinegar vinaigrette is a little piece of heaven. Throw a lightly-fried egg on top and that little piece of heaven got much, much bigger. 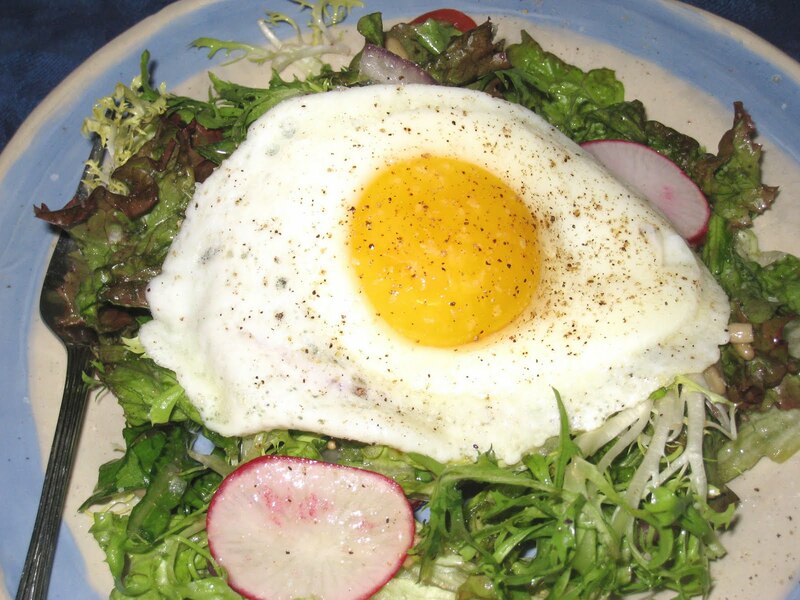 Crack the yolk and let it mix with the greens and the vinaigrette and you just might have reached nirvana. I've always wanted to try this so thanks for the inspiration! Your combination of ingredients looks perfect. I'm glad you think so, mjskit. It took me a while to get brave enough to tr it. I don't know why, it was really easy and delicious. I hope it works out well for you. Thanks for stopping by!